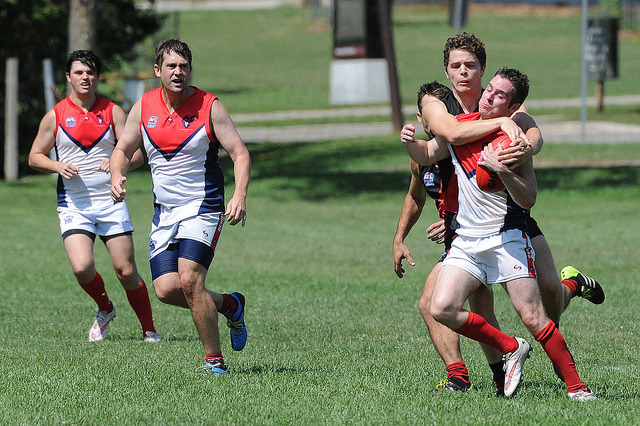 The Toronto Dingos wrapped up the 2015 AFL Ontario regular season with a huge win over the undermanned High Park Demons. Wade Edwards increased (by 13) his club-record goal total for the season to a whopping 71 goals, while James Duggan nabbed 4 and trio of Dingos chipped in 3. A total of 8 Dingos got on the scoreboard - which was a 28-goal total - while the backline core held the Demons in check throughout the entire match. A special tip of the hat to Patrick Bossey, who nabbed the first goal of his career after 50+ games. With the win, the Red and Black wrapped up the 2015 season with a 9-3 record, good for 2nd place on the ladder and a spot in that all important, non-elimination Qualifying Final against the the 1st seed... the Toronto Eagles.